School started this past Wednesday – WOO-HOO!!!!! I love the beginning of the school year because the kids are filled with such energy and enthusiasm!! I’m looking forward to eating lunch with them and hearing what awesome things they did during the summer!! I’m REALLY excited for what’s going to be our BEST school year yet!!! Please keep all of our students and faculty in your prayers. Just a reminder, since school has started, our daily Masses on Tuesdays and Fridays will ALWAYS be at 9am – not 8am. There are no exceptions – so even if school is called off because of snow, or if school is off because of a holiday that falls on a Tuesday or Friday, Mass will still be at 9am. The rest of the week (M,W,Th,Sat) daily Mass will be at 8am. One more reminder, since school has started, the Turfway entrance/exit will be closed from 3pm – 6pm every day that school is open. Tuesday, August 22 is the Feast of the Queenship of Mary – and since our Parish is named after that feast day, I can’t think of a better reason to have a HUGE party!!!! The party will be THIS SUNDAY, August 20 from 4:30pm – 7pm on the front lawn of the school – you won’t be able to miss it because of the gigantic tent! Be sure to bring the whole family because there’ll be games for the kids. This is a fantastic way for us to get together as a parish family for food, fun, and fellowship – and our very own Terry Hoppenjans will be playing some fabulous classic rock on his acoustic guitar!! The parish will provide the burgers, hot dogs, metts, etc. and all of the drinks and you-all can provide the side dishes and desserts – YUMMY!!! 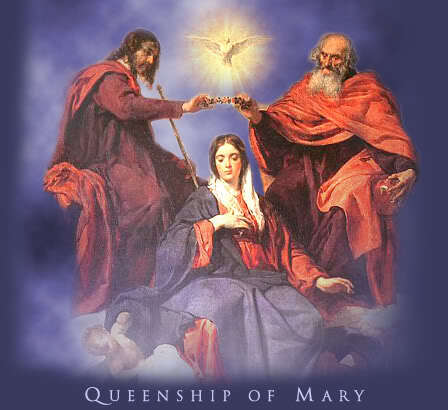 See you-all on Sunday – Mary, Queen of Heaven, pray for us!!! I often get this question, “Fr. Kevin, how many times can I receive Holy Communion in one day?” That’s a good question, I’m glad you asked. The answer is twice. You can receive Holy Communion two times in a day as long as you attend both Masses. The reason for only receiving twice in one day, and the need to attend the Masses, is there are instances where people on a daily basis just ‘pop-in’ at the end of a Mass(es) in order to just receive Communion – almost as if they’re getting their “Jesus fix” rather than participating in the Mass and wholeheartedly worshiping God. So, receiving twice a day allows one to attend a morning daily Mass and receive Communion, and then attend a wedding or a funeral Mass (or a vigil Mass) that same day and receive Communion again. Got it?? Also remember, and this is very important, there’s a one hour fast before receiving Holy Communion. Why can’t we eat or drink anything (except for water or medicine) for an hour before receiving the Eucharist? Because the fast promotes a deeper reverence and respect for this most important sacrament. We are actually receiving the Body and Blood of our Lord into us, and the fast helps us realize how important this is. However, the one hour fast doesn’t apply to the sick or elderly. 5 classic rock songs that’re on the top of my playlist right now: 1) Don’t Fear the Reaper, Blue Oyster Cult (love the words in this song – even more than the cowbell!!) 2) Beth, Kiss (I could listen to this song a million times and never get tired of it) 3) Werewolves of London, Warren Zevon 4) Cheap Sunglasses, ZZ Top 5) White Rabbit, Jefferson Airplane. Your top 5? ?